Chapter 90: Seven Injuries Fist and Crimson Flame Palm! Not far away, an intense fight was going on between the Green Jade Python and the tall skinny man. Wherever the snake moved through, trees would shatter, pieces of rocks and sand would be sent flying and the ground would crack. Whenever enemies meet, old wounds are opened. The snake stared keenly at the man, sticking to him at all times, not letting him have a moment of rest. “Brother Ji, hurry up and finish the fight! I can’t hold back this snake for much longer!” The tall skinny man shouted. He was already in a very bad state. Disheveled hair and bruised all over by the violent winds caused by the swinging of the snake’s tail. A trail of blood was running down the corner of his mouth. The leader, who was called “Brother Ji”, started to take his fight more seriously. He realized that this brat was too abnormal. At the start of the fight, he was still able to catch up to the kid, but now, he had absolutely no way of following the kid’s movements. Seeing the situation of his companion, the leader frowned as he gritted his teeth slightly. Power burst forth from his saber as he used his saber technique. Forming a seal, light radiated from the sword as Yuan Qi rippled out and a fierce golden light burst out from the saber. The leader hollered. He found an opportunity. With the slash of his saber like lightning, a golden light glimmered and a merciless cruel aura emanated as the blade swung down on Su Yi. The saber sliced through the air, sending sand and broken stones flying. Now, there was no doubt that the leader was using all his might. He was no longer holding anything back. Su Yi continued using the “Hundred Transformations Step”. The essence of the technique laid in its countless transformations. Tricking people, making his movements seem real yet fake, almost impossible to follow. His body left a trail of afterimages and Su Yi managed to achieve the unimaginable as he barely dodged the saber. But the sharp wind managed to cut a few strands of Su Yi’s black hair, leaving a stinging pain on his face. Suddenly, at the very same moment, the leader sneered coldly. He had already prepared for this situation to happen. That slash was just a feint. Behind the trail of light left by the saber, his left hand clenched into a fist shot out. Golden Yuan Qi enveloped the fist like a golden membrane. A ruthless aura exploded in that instance. 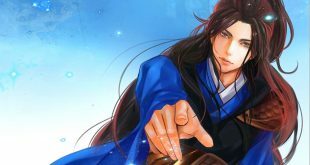 The man shouted as his fist brimming with golden light sealed all paths in front of Su Yi and furiously headed towards him . This fist was his real attack. Ruthless and swift, it shook the space around it as the energies of heaven and earth resonated in a buzz. But, Su Yi’s face still remained calm, and the corner of his mouth curved upwards slightly. His face showed that he expected this move and was looking forward to it all along. Instantly, during this rapidly approaching dangerous situation, Su Yi’s speed was turned up another notch. Yuan Qi rushed through his wide refined meridians like a flash flood. His robust and wide meridians allowed the maximum amount of Yuan Qi to flow rapidly through his body. It was like comparing a small slow stream to a raging wide river. The force and intimidating aura of the two could not be compared at all. Within the same cultivation level, Su Yi’s meridians were like the raging wide river, his Yuan Qi was also far more condensed than cultivators of the same level as him. It was the first time Su Yi used his full might during this fight with the man. Facing the man’s ringed saber, even if Su Yi had an extremely tough body, he did not dare to take the blade head-on. Finally, he found an opening within the man’s attacks. Feeling the ruthlessness of the fist, Yuan Qi boiled within Su Yi’s body. Bloodlust swirled within the depths of his eyes along with a craving to fight. The coldness of his eyes sent chills down people’s spine. Yuan Qi flowed within the special meridians of his body and a wave of power suddenly exploded from within Su Yi. Su Yi shouted within his heart. At the same time, Su Yi let loose his fist, the aura around his body burst out and black colored Yuan Qi flowed. With a violent thick wall of wind, his fist recoiled and shot out straight against the incoming fist. The two fists collided in the blink of an eye. The different Yuan Qi smashed against each other, the impact of the energies gave off the sound of an explosion like that of roaring thunder, echoing through the forest. A curtain of sand and stones were sent soaring into the air as the ground trembled. The terrifying wind caused Su Yi to stumble backward. He put his foot back and quickly stabilized himself after a few steps. He was surprised. This “Mountain Shattering Fist”, it was quite powerful. For the man, he was sent sliding back across the ground, forming two straight trails with his feet. The ringed saber in his right hand had been hit off his hand by the impact. The membrane-like Yuan Qi on his left fist was cracked,his face was pale and his hand was bruised and sore. What shocked the man the most was that the fist contained a terrifying power, wave after wave, it hit his fist endlessly. The fist had seven different forces, it may be aggressive, it may be calm, or it may have calmness within the fierceness of the fist, or fierceness within the calm. The force can be shot out or it can be retracted, or it impacts the opponent directly. He could not block the continuous impacts at all. Finally, under the terrible waves of impact, his internal organs were severely injured. The man could not hold back any longer and spat out a mouthful of blood. The man stabilized himself but his heart quivered. He had suffered internal injuries and realized that the brat’s martial art technique was far stronger than his “Mountain Shattering Fist”. That brat was obviously only Yuan Soul Realm Sixth Grade, yet the Yuan Qi within his body was so abnormally strong and together with that extremely strong martial art technique, he had severely injured him. This made the man deeply shocked. The moment the man had just stopped moving backwards, Su Yi dashed forward, leaving only a trail of afterimages behind. The black-colored Yuan Qi which surrounded his body had also changed to a deep crimson. The man’s heart missed a beat. He was panicking. At the start, he thought nothing of the brat, but now, his heart was palpitating with fear. That brat was so young, and he could already fight him, a Yuan Xuan Realm who was almost at the Peak of the First Grade and even injured him. In a few years’ time, wouldn’t this kid be even stronger? Furthermore, the situation at hand was more important. This kid does not seem to have any intention of letting him go, the brat was way too fast. The hand seal formed, and fire attribute Yuan Qi exploded. With a low roar, Su Yi dashed towards the man to attack him. When the beast is sick, take its life! Su Yi did not want to miss such a good chance. He had cultivated the “Crimson Flame Palm” and “Seven Injuries Fist” together. Both were General grade martial art techniques, right now, Su Yi held nothing back. Fire attribute Yuan Qi flowed like a blazing fire emanating from the hand seal. That fiery aura made the air around him vibrate with heat, causing a burning sensation on the skin and hairs to stand on their ends. The face of the man changed greatly. He had no time to block this attack. He let his Yuan Qi out to form a cocoon, enveloping his entire body. Yuan Qi Cocoon. This was the difference between a Yuan Xuan Realm and a Yuan Soul Realm. At the same time, cold bloodlust erupted from his heart. Bloodlust radiated from his eyes. He did not believe that this brat who is only Yuan Soul Realm Sixth Grade could take him head-on. He threw out his right arm and met Su Yi’s attack with a palm.